City jewels Written on July 6, 2009, by Ingeborg. 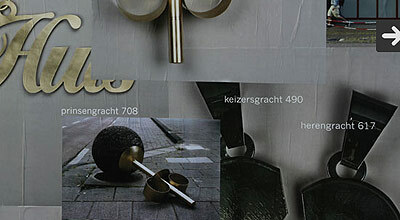 Liesbet Bussche graduated at the Rietveld Academy in Jewelry. Her final work dresses up the city. Ordinary objects in public space are made into precious jewels, like the police line from knitted cloth, the earpin that makes the concrete anti-parking ball into a pearl. The house at Prinsengracht is in love with one at Keizers’, taken from the necklace with half heart they share. Read more from the Dutch design, Graduates 09 category. Stay up to date via RSS , or Trackback from your site.